Unser Korrespondent in Manila, Florian Prischl, hat den dritten Tag der World Universities Debating Championships (WUDC oder Worlds) zusammengefasst. Lest hier, was sich am dritten Tag des größten internationalen Debattierwettstreit zugetragen hat. 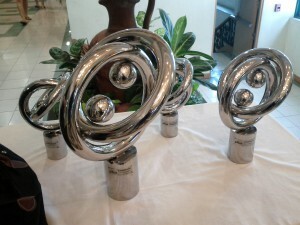 The trophies for winners of WUDC 2012 at De La Salle University, Manila. It was another busy day at De La Salle Worlds in Manila, and debaters got a glimpse of what they all hope to hold in their hands on January 3 – trophies!The day started off as usual with a great breakfast – your correspondent recommends the fresh pineapple especially – and ran smoothly overall. Some small annoyances such as long wait times at elevators are being addressed by DLSU organizers, and their dedication to Worlds participants really shows. A big Thank You! to the tireless volunteers at this tournament! As any experienced debater will readily confirm, it is hard to actually wake up debaters and to make them be on time. This is why starting tomorrow, various prizes including three laptop computers will be raffled off before draws and other announcements. If your name is drawn and you are present, you may claim your prize – if you are not here, the next randomly drawn person may get it. It will be interesting to see if such incentives are enough to overcome the debaters‘ hangovers.Today’s motions were clearly a step up in difficulty from yesterday’s, which was not least demonstrated in the text-laden information slides for round 5 and round 6. Round 4: This House would require individuals to use all their wealth beyond USD 5 million for philanthropic projects. Round 5: This House would require deaf parents to send their children (whether deaf or hearing) to mainstream schools for their primary and secondary education. Round 6: This House supports politicians who pass progressive legislation, even where this is contrary to the wishes of the democratic electorate. Closed rounds will commence tomorrow. Until then, Can Okar and Florian Umscheid are collaborating in compiling comprehensive unofficial tabs via Twitter and other sources. Can’s version can be found on Google Docs, while Florian posts the tab to Berlin Debating Union’s Facebook page. Please help Can and Florian and let them know about results via their respective Twitter accounts (@canokar & @FloUmscheid), our own Twitter account or via e-mail to team [at] achteminute [dot] de. Today, keeping with the spirit of „Friday“ (Fun! Fun! Fun! Fun! ), was German Club Night at DLSU Worlds! The organizers of WUDC Berlin 2013 showed off some of the many things they have planned for next year’s Worlds. Everyone else had an opportunity to eat German Kartoffelsalat and a lot of other delicacies. Of course, plenty of beer was provided as well! 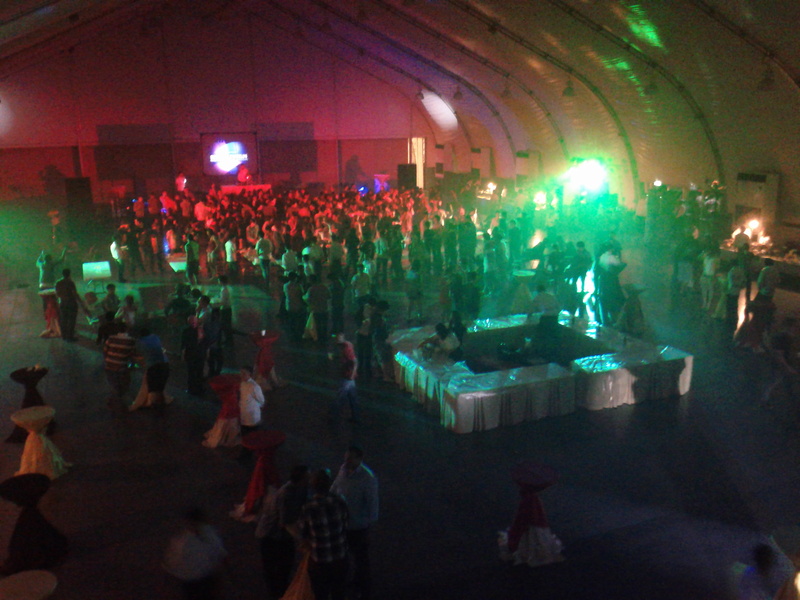 Partygoers abound at WUDC 2012 German Night! Since 1981, debaters from all over the world have been competing at the World Universities Debating Championships (WUDC or Worlds) at alternating locations across the planet. It was not before 1996 that the British Parliamentary Stylebecame the mandatory format for this annual tournament. From 27 December 2011 to 4 January 2012, the international debating community assembles in Manila for the second time: 1999’s host was Ateneo University in the Philippinian capital – the first time for WUDC to come to Asia at all. Language of debate is English and there are three categories: “Main” for native speakers, “ESL” (English as a Second Language) and “EFL” (English as a Foreign Language). Current World Champions are Monash A from Australien („main break“), Haifa A from Israel (ESL) and Tokyo B from Japan (EFL).